A story today in the Wall Street Journal points to a sobering reality. 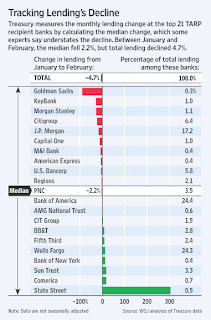 According to the WSJ's analysis, lending activity by the banks receiving TARP funds decreased by a total of 4.7%, month over month, between January and February. This sounds a little ominous, but when you factor that out over 12 months (remember, that's a one month decline), you get a decrease in lending activity of 56.4%! That's huge! Essentially, we pumped billions of dollars into a bunch of banks in order to get them moving again. And what did they do? They DECREASED lending activity! The real question, though, is what does it mean? First, despite all the bailout money we've pumped into the various banks, they are loaning even LESS money. And that's a problem. Because this house of cards our government is trying so valiantly to prop back up requires the loaning of money (not that I'm an advocate by any means; I'm merely trying to establish the fundamentals of the government's plan). We need to circulate more money in the economy, but people don't have money. So they need to borrow more from banks, which means the banks need to loan more. But the banks are broke, which means we need to give them some money to loan. Which, after a great deal of analysis, brings us to this question: if we give the broke banks money to loan, and their lending activity DECREASES, what do we do next? The obvious answer is give the banks more money, right? Wrong. The truth is, we're merely trying to prop up bad businesses. It's true of the auto companies, the banks and the insurers. They're poorly run, inefficient businesses--and the truth is, they can't compete with the rest of the world. So why in the world would we want to throw more money at them? In the REAL world (the one that you and I live in), high performance is rewarded with returns; poor performance with failure. Why would it be so terrible if the banks failed? I know: that comment qualifies me as an ignorant buffoon, right? I mean, think of the lost jobs, the lost money, the vacant high rises in New York (and the resultant plummeting NYC Class A rental rates). I'm just narrow-minded and downright ignorant. Perhaps. But before you pass final judgment, consider this: according to statistics compiled by the Small Business Administration (SBA) over 50% of private sector employees in the U.S. are employed by a small business. Further, small business accounts for over 45% of the TOTAL PAYROLL across the U.S. (including private sector payroll). Even more remarkable is the fact that between 60-80% of all new jobs created over the last decade have been created by small businesses! Profound numbers--all of them. And they seem to indicate that, first, small business is substantially more impactful on the economy than are these giants that are being bailed out. Additionally, small business is growing in proportion to big business (the lumbering giants are slowly but surely being overtaken by their swifter, more innovative and much smaller counterparts). And I would contend that that's OK. Why not let these giants fail--and let the small businessmen (who are actually, based on the statistics above, GROWING our economy) keep that tax money, and put it to PRODUCTIVE use in their OWN firms? But then, what do I know? I'm just an ignorant buffoon.